Great taste gold 2011. Clean ingredients. Whole grains. No Nuts Recipe. Wheat-free. High fibre. No refined sugars - contains natural sugars from fruit. Vegetarian Society approved. 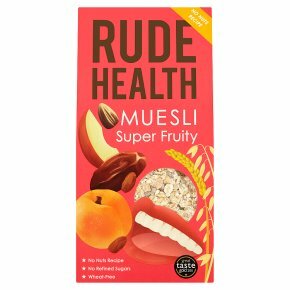 Kosher - KLBD.The fruit we put in this muesli has ripened and sweetened in the hot sunshine. The seeds come from pumpkins and sunflowers that soaked up rays all summer long. Come autumn they all get harvested and mixed into our blend of smooth oats and toothsome barley and rye flakes. Each spoonful of soft, succulent fruit and high-fibre crunchy grains will have you riding a wave of pleasure for the rest of the day. Softly, softly You don't need to start every morning with a crunch. Sometimes you just have to take it slow, soft and quiet. If it's one of those mornings, then Super Fruity is for you. This muesli has no crunchy nuts, just little bites of seed. To make it even softer, pour in the milk before you eat it. Five minutes will make a difference, overnight in the fridge will transform it. The grains go creamy, and the fruits infuse their flavour... it's like a bowlful of meditation. How we like it This muesli just can't get enough fruit, so we really go over the top. Grate apple over it, make it with fruit juice rather than milk. Pile it on! Like fruit? Then you'll like our Fruity Date Porridge, where the fruit is hot. The dates go all caramelised and melty through the whole bowl.